Introducing our new Regular Fit light weight stretch jean just in time for the summer, this jean is perfect to help beat the heat! Crafted with light weight 11.5 ounce premium denim woven with 1% elastane stretch that makes for the perfect combination of weight and comfort. Our Regular fit jean is designed with a slightly higher rise that sits up on the waist, and a traditional straight leg with a comfortable fit through the hip, thigh and knee. As always,our innovative gusset design is sewn into the stride providing superior comfort and ease of movement. Dark stone wash enhances the unique denim character creating a slight grain appearance. 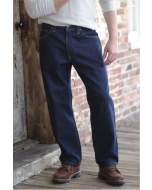 Proudly Grown and Sewn in the USA with American denim and trims.